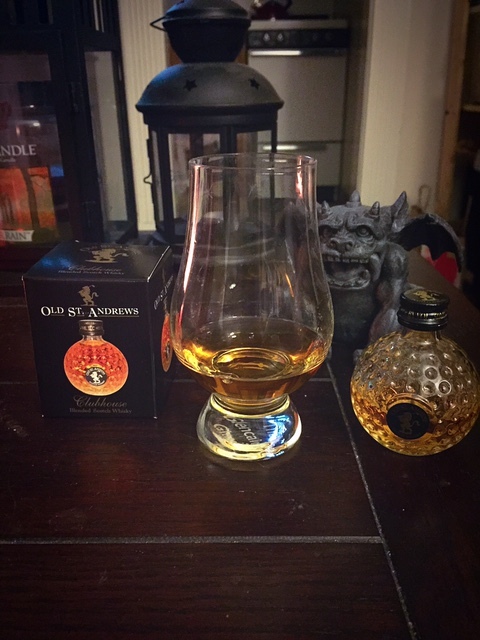 Not too long ago while out shopping with my boyfriend, he spotted a miniature bottle of Old St. Andrews Clubhouse blended whisky and off course, he bought it for me so I can write about it. One of my boyfriends dream is to one-day play golf with his buddies at the St. Andrews Golf Course in Scotland, as it’s considered the home of golf. They are golf fanatics after all! We had not heard of this whisky blend before spotting the bottle, so he was, as excited to try it as I was. Old St. Andrews Clubhouse blended scotch, blends selects premium malt and grain whiskies to accomplish its unique finish. It is matured in oak casks used at one time for sweet wines, sherry or port. What’s also unique about this whisky is the packaging as it comes in a very distinctive golf-ball shape bottle. While researching this blended Scotch, I read review upon review that simply just raved about this whisky. I on the other hand didn’t love it. Don’t get me wrong, I don’t think it’s a bad whisky, to me it’s just simply forgettable. My boyfriend felt that the taste was a bit lackluster and I completely agreed with him. It is very well blended whisky. I enjoyed the creaminess and the lightness of it. A splash of water did enhance its flavors and made it even lighter. Honestly, it’s not a whisky I would buy for myself, but it’s a very simple blended whisky with no bells and whistles. It would make a great gift if you have a loved one that loves golf. Worth buying just for the shape of the bottle?